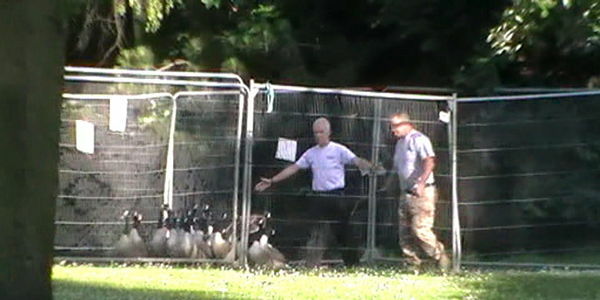 Sandwell council in the West Midlands, England have killed many Canada geese at Dartmouth Park West Bromwich and Victoria Park, Tipton in 2013 and 2014 by rounding them up and breaking their necks. We are a group opposed to this slaughter and this year we successfully stopped them from doing this again. However they continue to propose culling healthy birds as an option next year and again we need your help. ◾To seek scrutiny of Sandwell Council’s decision to kill Canada geese on these parks- where currently they only present biased uninformed opinions of certain council officers with vested personal interests and not examination of scientific evidence. ◾To challenge the misconceptions promoted about the bird by this council and others, and to promote education to the public about goose behaviour. ◾To campaign and lobby Sandwell council to never again allow a final solution such as culling of healthy geese to take place in the borough.